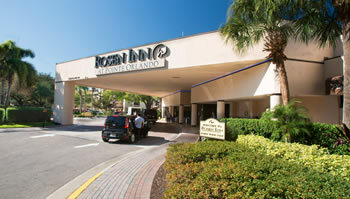 At Rosen Inn at Pointe Orlando, the location couldn’t be better. The hotel is centrally located in the middle of Orlando’s action-packed tourism area and right off of International Drive. More than 150 restaurants, hundreds of shops, rides, attractions, the Orlando County Convention Center, and six theme parks are within a 5-mile radius of Rosen Inn at Pointe Orlando. A great selection of entertainment, dining, and shopping outlets—most within walking distance—surround our hotel. Pointe Orlando, across the street from our guestrooms, offers visitors restaurants, famous designer stores, and an IMAX movie theater with 20-plus screens. Add to this neighborhood the North building of the Orange County Convention Center and it’s tough to find a better hotel location anywhere in Orlando. Scheduled Theme Park Transportation: Provided based on regular park operating hours* (does not run continuously) to Universal Orlando Resort™ theme parks, SeaWorld Orlando®, and Aquatica® via the Super Star Shuttle. Seating/standing space is limited and on a first come, first served basis. Reservations are required from the Universal Partner Hotel Vacation Planning Center located in the hotel lobby one day in advance and up to 30 minutes prior to departure. *Not valid for Special Events, Groups, or Early Park Admission. Scheduled Theme Park Transportation (ADA Guidelines): Scheduled transportation is provided based on regular park operating hours* (does not run continuously) to Universal Orlando Resort™ theme parks, SeaWorld Orlando®, and Aquatica® via the Super Star Shuttle. Advance reservations are required from the Universal Partner Hotel Vacation Planning Center located in the hotel lobby 24 hours prior to departure. Space is limited—one mobility aid per departure. Reservations first come, first served. *Not valid for Special Events, Groups, or Early Park Admission. Reservations must be made in person at the Universal Partner Hotel Vacation Planning Center located in the hotel lobby 24 hour prior to departure. Orlando’s public transportation system, Lynx, offers cost-effective transportation service with stops on International Drive near the hotel, to Orlando’s most popular theme parks, and other major areas, like: International Drive to Downtown Disney West Side Transfer Center, Downtown Orlando to Magic Kingdom, Downtown Disney to Orlando International Airport, I-Drive to Downtown Orlando, and I-Drive to Orlando International Airport. Lynx also operates the Lymmo service in Downtown Orlando – a free bus that takes commuters throughout the downtown district. It has its own lane and controls the lane’s traffic lights to ensure the bus will not be slowed by traffic. View Lymmo’s route and stops. Another budget-friendly and fun way to check out parks, sites, and shops along International Drive is to ride the I-Ride Trolley. The trolley provides service to popular I-Drive destinations like the Orlando Premium Outlets, amusement parks, and other attractions. I-Ride Trolley rates are relatively inexpensive. Multi-ride passes offer the most savings. View the I-Ride Trolley route and stops to plan your trip.